“Don’t follow the lights.” This was Gollum’s advice to Frodo in Sam as they traversed the Dead Marshes in The Two Towers. The Dead Marshes were haunted swamps which covered an ancient battlefield. The putrid water trapped the bodies and souls of those who had fallen long ago. Lingering too long could cause one to be lost to the murky abyss. Much the same could be said about DOOM. Except it takes place on Mars. In the future. And there are demons. From Hell. And following the lights is a good thing. Similarities abound! This does kind of look like Mordor! I’m playing through DOOM (2016 all-caps version, not the 1993 original) again. Seeing the gameplay reveal of DOOM Eternal at Quakecon made me want to. It’s just as much fun to play now as it was the day it came out. The action is as fast, frenetic, and adrenaline-inducing as it’s ever been. It truly is one of the most-fun shooters to have ever been released. 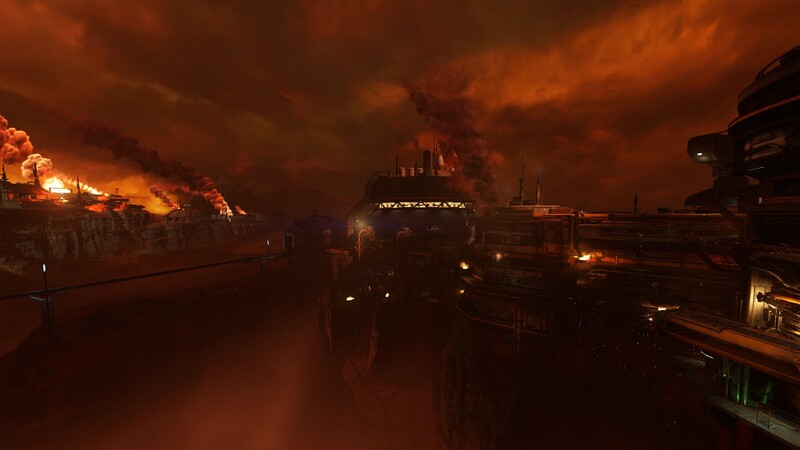 But amid all the action and explosions and flying bullets and bodies, it’s my opinion that part of DOOM’s appeal is often overlooked: the level design. Every room and corridor is a lovingly arranged bit of sci-fi aesthetic engineering. Employee lockers have contents spilling out of them, computer screens have data or error messages scrolling down them, safety warnings are plastered everywhere; there’s a lot of detail present even before it’s covered up by the remains of unfortunately dismembered base personnel. It’s not all cosmetic, either. Green lights guide the way. Present on walkways, railings, and equipment; these lights emit a piercing green glow which serve as a point of orientation. All you have to do is follow the lights for the surest route of more progress. There’s no way they could be called ‘subtle’, but they never look out of place. They’re placed smartly enough so as not to be noticeable when looking backward over your path of progression. This is especially beneficial after a disorienting gunfight. 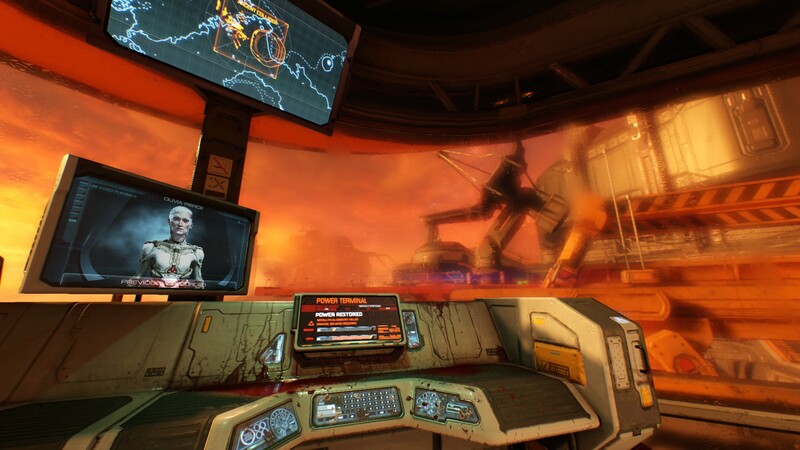 Between the lights and the in-game map, it’s almost impossible to get lost. But should you choose to get lost and ignore the guiding lights, you’re bound to discover something. And that’s the fun thing about exploration in DOOM: it’s never forced, but it’s almost always rewarding. 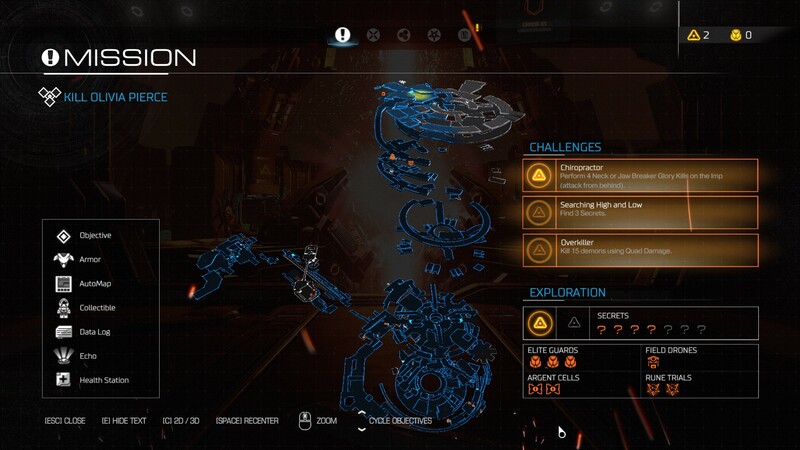 Exploring is the means by which you acquire upgrade points for your suit and weapons. Sometimes you’ll stumble upon an alternate path to your main goal. 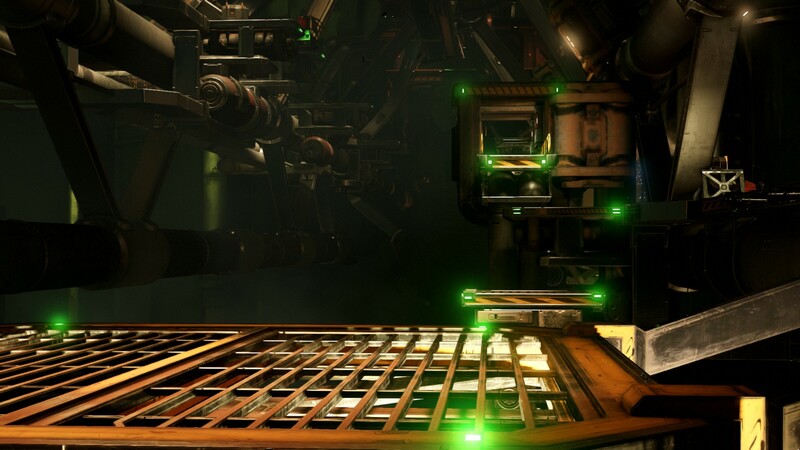 If you’re lucky, you’ll discover the hidden lever which unlocks the area where classic maps are unlocked. And if you know just where to look you might stumble upon more than a few Easter eggs, like a skeleton having a birthday party. You remind me that I still need to pick this game up.